In a newly-ratified partnership with Jonathan Shooter’s Oysterair, who are a specialist Approved Training Organisation in high performance aeroplane training, trainees will cover EASA and FAA certified class rating courses – ground and flight instruction – at Oriens’ HQ. 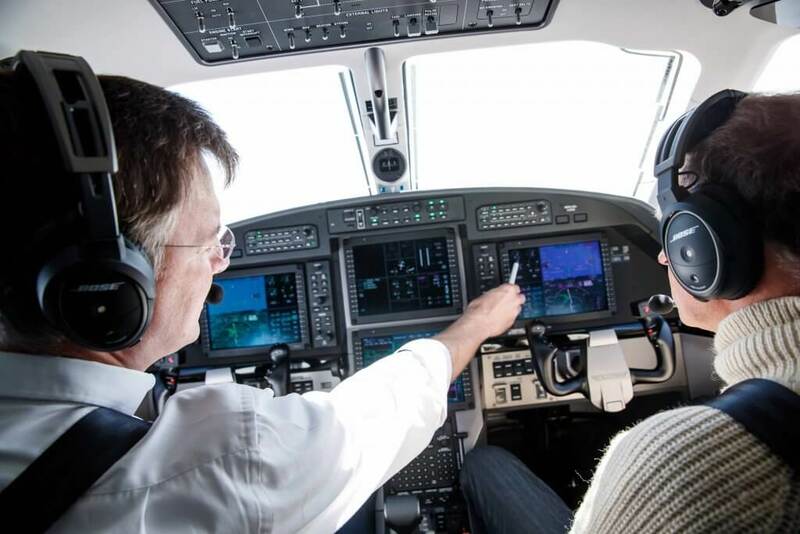 “We know that a big obstacle for Pilatus PC-12 operations in the UK is the lack of pilots. With the PC-12 classified in the Single Pilot High Performance Aeroplane (SP HPA) category, the traditional flying schools in the UK do not have such expertise. This is why we are pleased to team with Oysterair and their experienced specialist pilot instructors,” commented Edwin Brenninkmeyer, CEO. Offering pilot training, however, is especially close to Edwin’s heart. He started training for his pilot’s licence aged 14. An experienced PC-12 pilot and ambassador of Pilatus in the UK, he has amassed some 4300 flying hours and flew some 150 PC-12 demo hours in 2018. The first days are completed via an online learning management system affording the student flexibility with his/her time. Checking in at Oriens Aviation training at London Biggin Hill, pilots are required to sit a theory wash up day and then an exam, ahead of flight training. Oriens is also partnering with Oysterair to offer two-day conversion programmes from ICAO/FAA licence to EASA licence; a PC-12 SET Class Rating, as well as difference training from the PC-12 to PC-12NG variants. Oysterair, which has been specialising in SET pilot training for four years, is already active at Lydd and Gloucester Airports with its PC-12 courses. London Biggin Hill will be its third base. “With the growing number of PC-12s visiting and based at Biggin Hill, our new base is well placed to meet the growing market,” concluded Edwin Brenninkmeyer. The Pilatus PC-12 can fly up to eight passengers in a luxury pressurized cabin, for up to 1,800 miles, at 320 mph and at 30,000 feet. The PC-12 features a generous cargo door and can operate from small airfields of 800 m, from gravel strips and grass, combining to make it one of the most versatile and practical aircraft. It can carry more payload than most for half the money. With a price tag of US$5 million, it can be a business aircraft / an air ambulance (able to convert inside an hour) a cargo aircraft and everything in between. It also holds the best residual value in its class, retaining 80% of its value after 10 years. The PC-12 has operated in the Arctic Circle, the African Plains and is a regular stable with Australia’s time crucial Flying Doctors. Its reputable single engine Pratt & Whitney Canada PT6 turbine is a legendary workhorse.